University of Northern Colorado's newest gateway building was topped out, marking a significant milestone event for construction and the progress of the new facility. 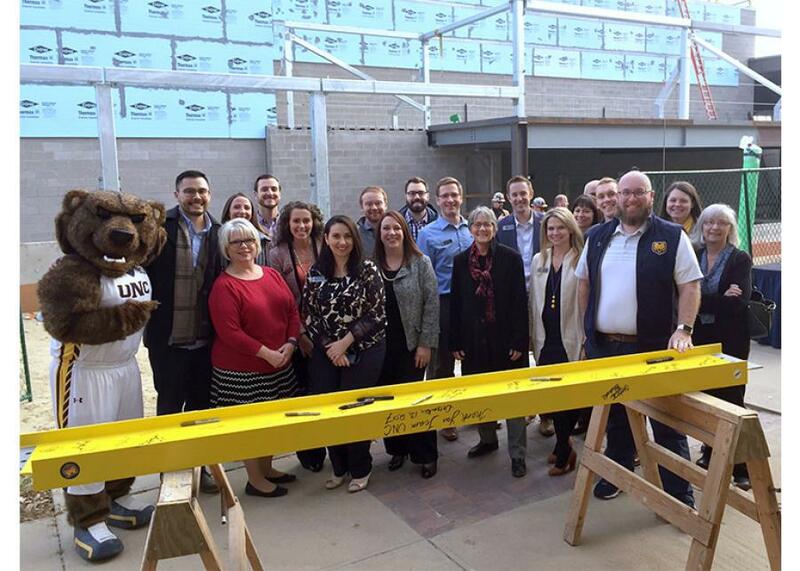 Alumni, faculty and staff donors signed their names onto the final structural beam, representing the importance of Alumni and donor engagement to the campus community. The beam was then picked up and set behind the performance hall. Designed in tandem by Semple Brown Design and Handprint Architecture, this new 110,000-sq.ft., LEED Gold facility will include a 600-seat performance venue; a 400-seat multi-purpose auditorium; an art gallery; and a café. Campus Commons is envisioned as an innovative campus navigation and support center for students, while being a showcase for the University's highly-regarded music and musical-theater programs. The building will tie into the existing University Center while maintaining the appearance of a stand-alone gateway facility. AP worked with the design team throughout preconstruction services to evaluate design options, building materials, and preplan logistics. “The event was a fun and a successful experience for our donors and campus community, without whom this project would not be possible,” said Allie Steg Haskett, vice president of development and alumni relations. The facility is set to complete summer 2018.